I started this once and didn’t finish. Sorry. I am on a diet and trying not to focus on food, but it is hard. This is a really low fat recipe, but you would never believe it. The alfredo is made with skim milk and is very good. As you know, I do not usually cook low fat. But Bob and I have put on a few middle age pounds and my old philosophy of “just eat smaller portions” isn’t really working for us any more. But I would not post this if it wasn’t really good. My friend Molly, says it is one of her very favorite “Cindy” recipes. She used 2 tsp. creole seasoning, she likes it really spicy. 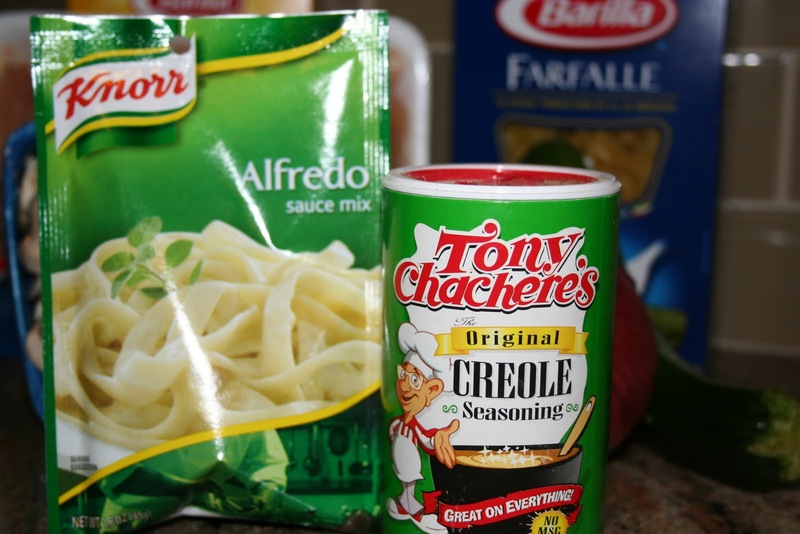 A couple of ingredients you might not be familiar with is Knorr Alfredo sauce mix (found in the powdered dry mix section) and Tony Chachere’s Creole seasoning (found near the salt in the spice aisle). Fill a 2 quart sauce pan with water and bring to a boil. Add one tsp. salt. In a skillet saute the vegetables in 2 Tbsp. butter or olive oil. Keep warm. Prepare chicken. See picture and note below. Add pasta to water and boil until done. Drain. 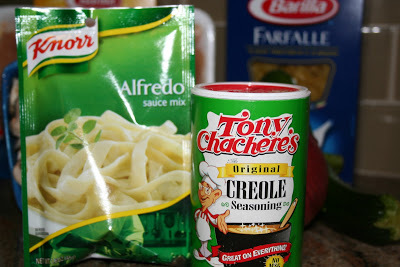 You can either add the alfredo to the pasta or add it to each individual serving. 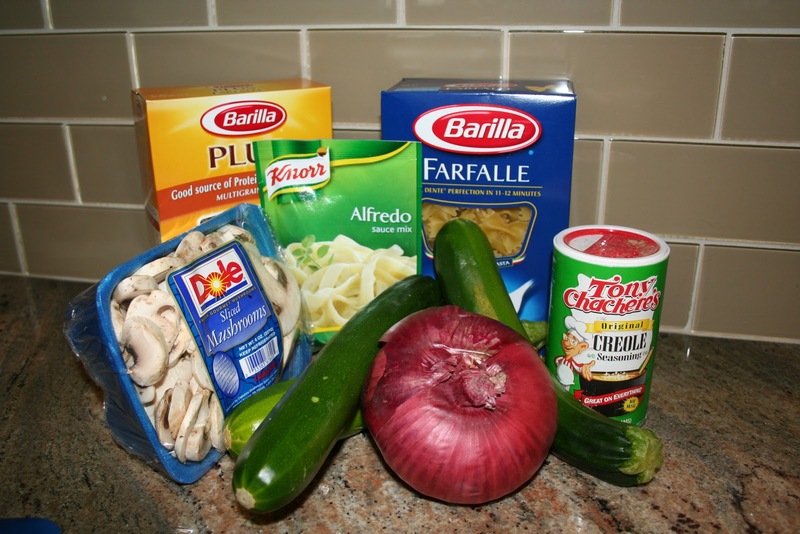 Build your pasta. Place one serving of pasta on a plate, add chicken, then vegetables, then cajun alfredo. Fresh chicken breast tenders, season with 1 tsp. creole seasoning and grill on a panini press or George Foreman grill. 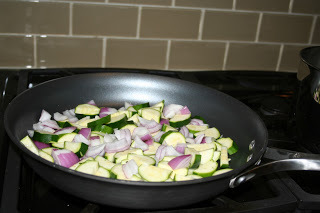 Or saute in a little olive oil in a skillet. You could also chop it and then season with creole seasoning and saute. Or you could by a rotisserie chicken from the deli and chop it. You can add a little extra creole to the sauce if you buy the chicken pre cooked. 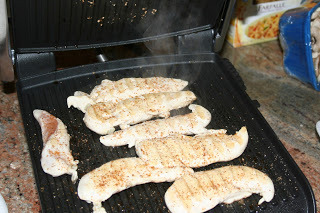 Or even easier would be the Tyson frozen grilled chicken breast strips. Thaw and cut into chunks. Slice the zucchini in 1/4 inch slices then cut them in half. Chop the red onion in 1 inch chunks. Slice the mushrooms (or buy them pre sliced). Saute in 2 Tbs. butter or olive oil until tender. 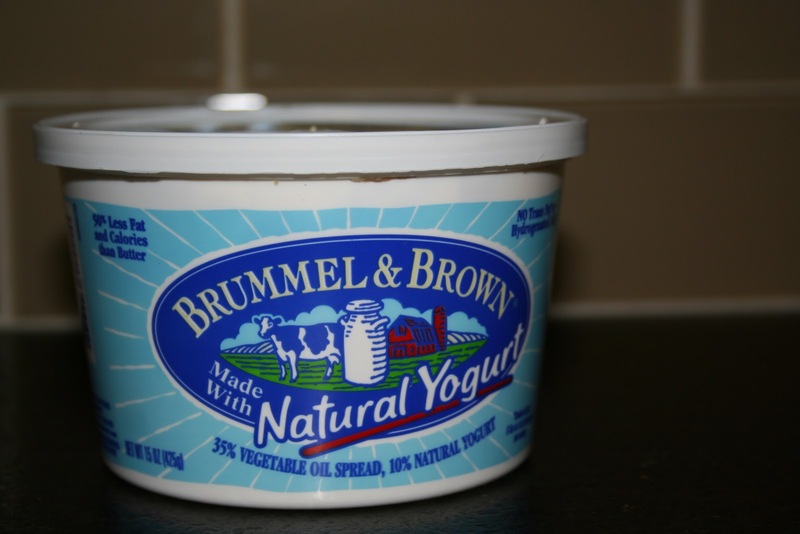 *Have you tried this yogurt butter? 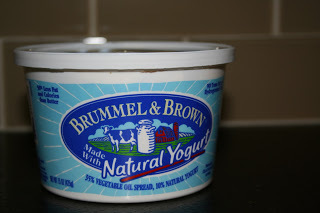 I really like the flavor and it is much lower in fat than regular margarine or butter. You can use it to saute the vegetables. Enjoy! This would be a great dish to serve on Valentine’s day. I posted a full Valentine’s dinner last year, that you might want to try. Just look it up in the archives.